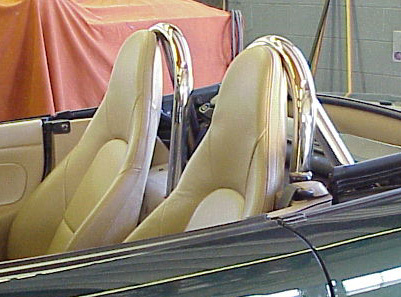 The Deuce, Hard Dog's double hoop roll bar, has styling reminiscent of the AC Cobra and other vintage marques from the golden era of sports car racing. Secured with rearward bracing, the Deuce mounts to the unibody framework inside the rear wheel wells using our crash tested frontal and backup plate design. 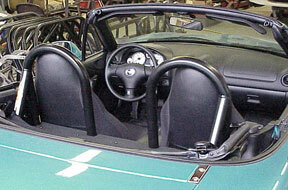 The mounting system combined with the highest quality heavy wall tubing and single bend hoops with multiple stress-critical attachments creates an unparalleled structural support for this type roll bar. The Hard Dog Deuce is available with center mounted rear braces on the main hoops for a retro Cobraesque appearance, or side mounted rear braces for a cleaner double hoop appearance. 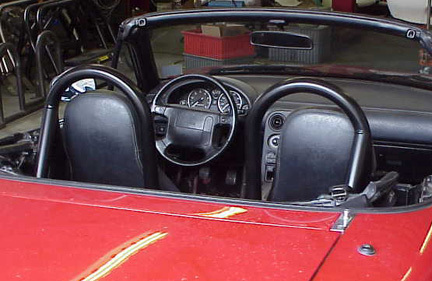 *Center braced Deuce compatible all flexible plastic rear window soft tops and with OEM second generation size converitble top glass rear windows or aftermarket windows of the same size and shape as the 1999 - 2005 Mazda glass rear window.